The fall has become a reflective time for me. That’s because in the fall of 2015 I learned I was pregnant….and then a few weeks later I learned I was pregnant with twins! Because of this the fall is like a checkpoint for me. I use it as a way to check in with myself to see how I’ve changed and grown since my life completely changed (for the better) when I heard those words “you’re pregnant….with twins!”. I usually reflect from fall to fall on how my life has changed now that I’m a mom. I think about my life before becoming a mother, as a new mother, and now as a toddler-mother (I won’t say experienced mother because I don’t know if that status is reached until your kids are like 60….and maybe that’s STILL not enough experience). I spent an embarrassing amount of time the other day scrolling through photos on Facebook reflecting back on falls all the way back to 7 years ago. But the other day, as I ran through a pile of crunchy leaves on a cool morning, I found myself reflecting back on the past couple falls – and thinking about how I’ve grown and changed as a runner. So take a walk (or a run, HA!) with me down reflection lane and look back to two years ago to the fall of 2015. I completed the Marine Corps Marathon in 4:38:57 at an average pace of 10:38. I was proud (and still am!) of that time. I fought for that finish because I really didn’t feel great the whole race – my stomach felt strange. In fact the first thing I said to my husband after I finished was “my belly feels off”. It was my third marathon in a year – about 360 days earlier I had run the NYC Marathon in 2014 – so I considered myself to be in the best shape I had ever been. Little did I know, but would soon learn, I had TWO stowaways riding in my belly which most likely explained the nausea I felt for the majority of the marathon. Then let’s jump to fall of 2016. I was 4 months postpartum with the twins. I had been working out fairly consistently for about 1.5 months. I was running 3-4 days a week and taking long walks almost every day. I completed my first postpartum race – CGI Racing’s Perfect 10 Miler – which I finished in 1:43:16 at an average pace of 10:19. I remember feeling so excited after the race. Not only had I gotten up super early to drive an hour from home to run – a feat in itself when I had two barely-sleeping-through-the-night 4 month olds – but I felt so proud of myself for training and completing a double digit mileage race! So here we are, fall of 2017. I’m 16 months postpartum. I’m in the 17th week of training for the Philadelphia Marathon – my first full marathon since the twins’ arrival. I’m running 4-5 times per week and averaging about 30-35 miles per week with my highest weekly totals up at 44 miles/week. And this is the best part about this trip down reflection lane is that it has a great, happy ending because right now, in this fall I can confidently say I’m the BEST runner I’ve ever been. I’m running faster paces than I ever have – before or after babies. I’m stronger and I’m leaner. This change and growth has me ecstatic. There’s nothing better than looking back and realize you’ve changed in a positive way! But it got me thinking – why is this? Why am I running faster now than I was before the twins were born? Why do I feel stronger? What is the reason for this change? The truth is, I have made changes to my running and fitness routine to which I can attribute for this growth. There’s no magic when it comes to positive change. Some of the changes I made deliberately, and some came about by accident. But either way, these changes came with hard work to help me become a better runner. I’ve Ditched My Tunes: This was an accidental change. But in my opinion, the best one I’ve made. I used to always run with music and loved curating my running playlists for short runs, long runs, and races days. But when I started running with L&H in the jogging stroller, I left my earbuds at home. When I’m out pushing the jogging stroller I want to be able to listen for cars or other runners/pedestrians approaching me. Plus, I like to keep an ear out for any cries or fussies from my passengers. Soon after several weeks of stroller running, I found that when I ran with music on solo runs it was distracting! I couldn’t find my natural rhythm because I had a beat playing in my ears. I played with lowering the volume or wearing only one ear bud but then finally – I just went without! And I don’t regret it. I run SO much better without music. Not only does it help me take advantage of the time to myself – seriously what’s better as a mom than spending time alone with SILENCE – but also I find that it allows me to listen to my body much better. I hear my breathing and know if I need to slow down or can speed up. I hear if my feet are pounding which helps me correct my form – for me, loud feet means I’m running sloppy and inefficiently. And most importantly, it allows me to run at my own natural rhythm. Now that I’m running faster it makes me wonder – was I holding myself back for all those years running with music? Maybe I was running slower because I was sticking to the beat of the music instead of my own natural rhythm?I know what you’re all thinking: “NO WAY! I can’t run without my music.” And here’s what I’ll say: I never thought I would be able to run 20 miles without music ….but I did the other day. It’s possible. Just try! Start with 1 run a week and see how you do. Then maybe go to two. Try and see. Maybe it’s not for you! But maybe it is….you never know! I eat to run, not just run to eat. Maybe it’s my older age, but I’ve found in the past year that my body is much more sensitive to what I feed it than it used to be. If I eat like crap, I’ll feel like crap. Tough lesson to learn, but a great one to figure out. I used to finish a long run and think “YES! I just earned 4 cupcakes!”. Now, I still finish a long run and think “CUPCAKES!” but now, instead of eating 4 cupcakes I’ll eat one (okay, or two….) along with some whole grains and protein. I eat smarter. I think of food as fuel now instead of just a reward. Some of my worst runs this past training cycle have been a direct result of eating poorly the day before. And actually my best runs have come during weeks when I’ve really focused on my nutrition and hydration. I often joke with my husband that I’ve got to “eat to win!” during mealtime or the day before a long run because I like the way it makes me sound – I feel like a hyped up body builder. But it’s true! Eating smarter has helped me to run better and happier. I started cross training. FOR REAL. I now cross train, for real, 1-2 times per week and I have seen such great results in my form, physique, and running paces. I’m stronger and leaner than I have ever been. Granted, it helps that in addition to my organized cross training I’m hauling two 25+lb babies around everyday….that is true. But still, cross training in both organized and baby form has made a huge difference for my running. I used to consider doing 10 pushups a week or hitting up one yoga class every few weeks cross training. Actually if I’m being REALLY honest, I used to see cross training on my training schedule and think “oh good a rest day!”.But now, I take cross training much more seriously. And by seriously I mean I actually do it. 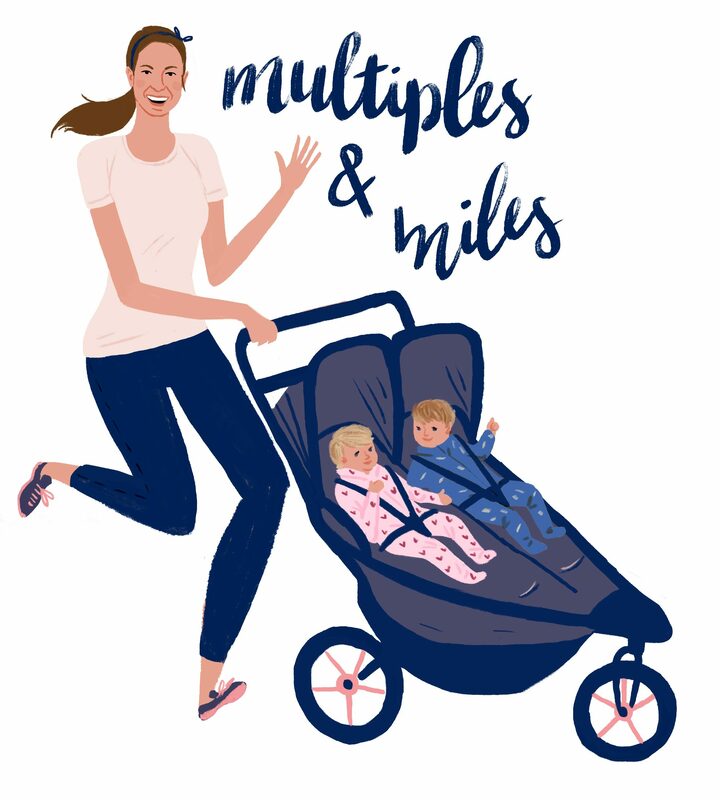 Over the past year I’ve started attending Fit4Mom Stroller Stride classes regularly and I’ve done a few sessions of HIIT Classes with Active Mom Fitness. The twins and I go to Mama’s Movers Yoga weekly – and while I’d like to say that’s a great workout, it’s mostly just me doing a few vinyasas in between chasing them around the room. Still, I guess it’s something! I also will sneak in some at home HIIT or Tabata workouts during naptime. These cross training sessions have made me stronger and has helped translate into faster paces and better runs! I’ve added a run to my week. In my previous race training cycles, I’ve run 4 times per week with one cross training (or as I admitted previously ‘whatever’ day) and one rest day per week. But my past two training cycles – my half marathon in March and this upcoming marathon – I’ve followed plans with 5 runs per week. The extra run has made a big difference. It’s increased my overall weekly mileage about 4-6 miles miles per week from my past plans. It may not seem like much, but this additional run has made a huge difference by helping me build stamina and speed. This is certainly not a one-size-fits-all approach – in fact none of the items on this list are – but it’s something that’s worked for me! I learned to juggle! If twin-parenthood has taught me anything (it’s actually taught me A LOT, but just work with me here…. ), it’s that you have to juggle. I often wake up with a vision of how our day will go – only to have things go completely different. I try my best to plan 4 steps ahead – but really most of the time I just have to take things as they come. Now that I’m a mom I’ve found that training cycles work best when I plan ahead – but also take things as they come. Take today for example, I woke up with the intention of running 5 stroller miles with L&H. But instead discovered after breakfast that H had a fever of 101.8 and just wanted to be cuddled. There was no way I was going to load him up in the stroller on a chilly day. So I took a breath, and started mentally rearranging my training plan for the rest of the week. Most of the time I follow my training plan by the week, but not the day. Meaning, I look at the runs as a whole and get them done on the days that I can….instead of in a specific order. If I have time to run 8 miles on Monday vs Tuesday as my plan calls for, I’m going to get it done Monday! I’m sure some (or most!) running coaches would scold me for this – but hey, I’m just doing the best I can. To get it done I’ve learned to juggle because at the end of the day I’m getting my runs in – and that’s all that matters to me. So there you have it. Thanks for joining me on my trip down reflection lane! I can’t wait until next fall when I look back, again, to see how far I’ve grown. I can only hope I’ve continued on such a positive path. I hope this inspires you to look back and reflect at your own path. How have you grown and changed as a person? As an athlete? Please share in the comments below! These are all such great tips! I think I might have to try more running without music, I am sort of an addict when it comes to that but I’m curious to see if it would impact my performance at all over time. Also, from what research I’ve read, while more weekly miles can be taxing on the body, logging them usually pays off in terms of improving overall as a runner. It’s certainly helped me!